Vietnam will make all efforts to, together with Russia, continue developing the two countries’ relations in a deep and effective manner in all fields, including defence, President Truong Tan Sang has said. Sang made the statement at a reception in Hanoi on March 5 for Russian Defence Minister General Sergei Shoigu, now on a working visit to Vietnam for the first time since he took up the ministerial position last November. The President highly valued the outcomets of the talks between Shoigu and his Vietnamese counterpart Gen. Phung Quang Thanh, and said he believed that the visit will contribute practically to boosting the bilateral multi-faceted cooperation. Over the past years, despite the difference in political mechanisms, the two countries’ cooperation has been effective and enjoyed fine development in line with the comprehensive strategic partnership and each nation’s interests, Sang said, adding that Vietnam is always grateful to the former Soviet Union and Russia for their wholehearted and effective assistance to the country during its national liberation and reunification in the past and construction and socio-economic development at present. The Vietnamese leader expressed his hope that in his new position, Shoigu will contribute to strengthening the two sides’ defence cooperation. Shoigu affirmed that he will do his utmost to effectively implement signed cooperation agreements on military and military technology. 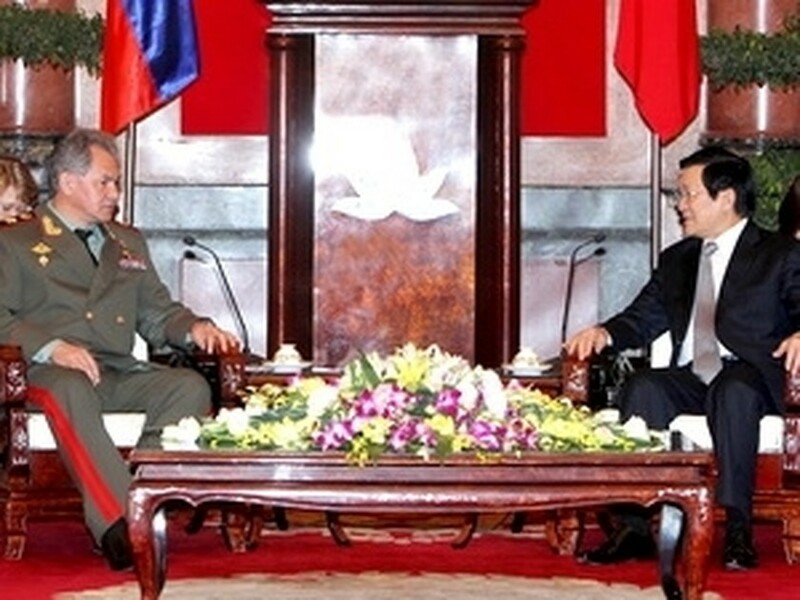 Earlier, Shoigu held talks with Vietnamese Defence Minister Thanh. The two ministers exchanged views on national, regional and international issues, reviewed the results of the cooperation between the two ministries over the past years, as well as worked out cooperation directions in the time to come. The guest said that the two armies’ cooperation has yet to match each country’s potential and demand. He suggested the two sides strengthen delegation exchanges and carry out specific orientations to lift the bilateral defence ties to a new height, suitable to the two countries’ traditional friendship and matching their comprehensive strategic partnership. Both host and guest agreed that in the coming time, the two armies need to focus on the fields of military and military technology that they have capacity.